What do you do with your old worn out jeans? After years of tossing out my husband's old blue jeans, I decided I'd make something out of them rather than add more trash to the local landfill. I always seem to have old jeans laying around the house and there is a reason for that. My husband needs jeans with a 32" inseam and they are just a tad too long for him. So, after a while, the hems get badly torn. They are too damaged to donate to an organization and I can never say no to more fabric. My solution to this dilemma is that I make things out of them, and one of my favorite things to make is this throw pillow cover. It adds a nice casual touch to my living room sofa, and it matches almost any décor. Because it is an envelope style pillow cover, it is easily removed from the pillow form for washing. This pillow makes a great gift for a student heading off to college in the fall. Put a few pens and pencils in the pocket, maybe even a few dollars, wrap it up and you are set! 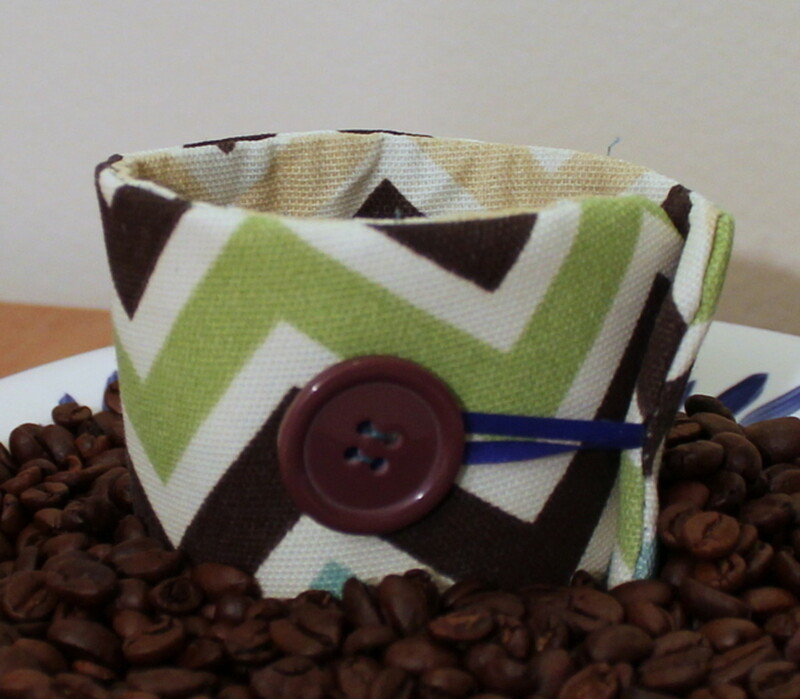 Making this is really easy and almost anyone with a sewing machine can do it. Just follow these step by step photos and instructions and you'll have your own throw pillow cover in no time. The following instructions and measurements make one throw pillow cover that fits a 14" by 14" pillow form. 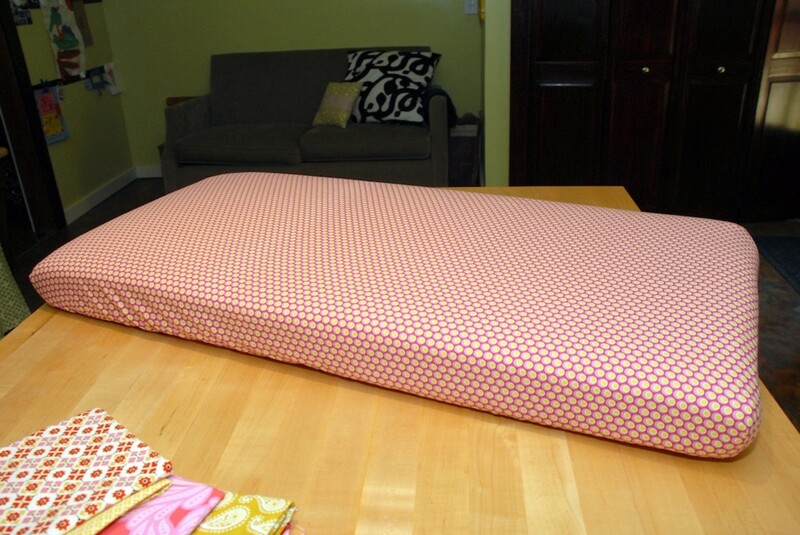 If you want to use another size pillow form, there is a table provided for cutting measurements. There are three types of pillow covers. Envelope - These covers can be easily removed and have an overlapping flap on the back side that is open. Zippered - These covers have a zipper on one side which allows for easy removal and washing. Stitched - These covers are sewn over the pillow form and cannot be removed. Scissors - Use good fabric scissors. Jeans are hard to cut through. 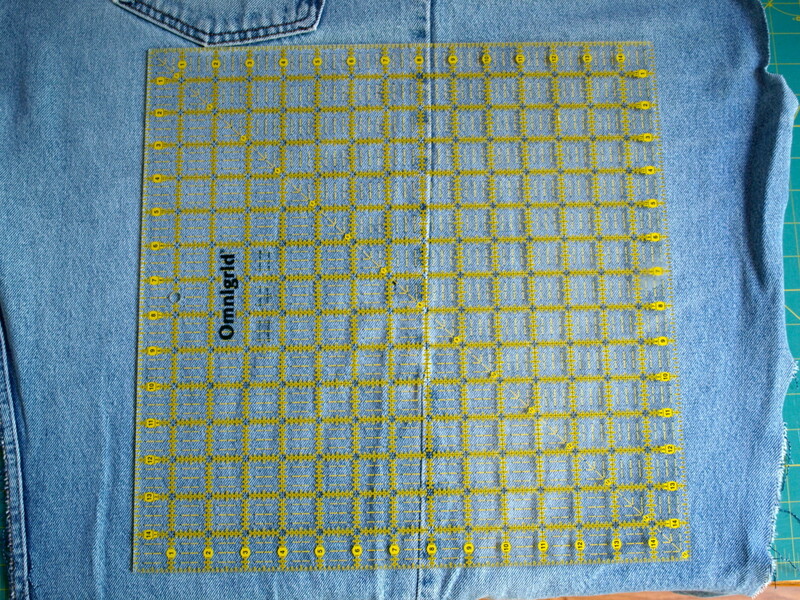 I use a quilter's ruler, a cutting mat and a rotary cutter to cut the jeans down to the size needed, but this pattern can still be used if you don't have these items. You'll also need a sewing machine and thread. Before beginning, make sure your jeans have been washed and pressed. 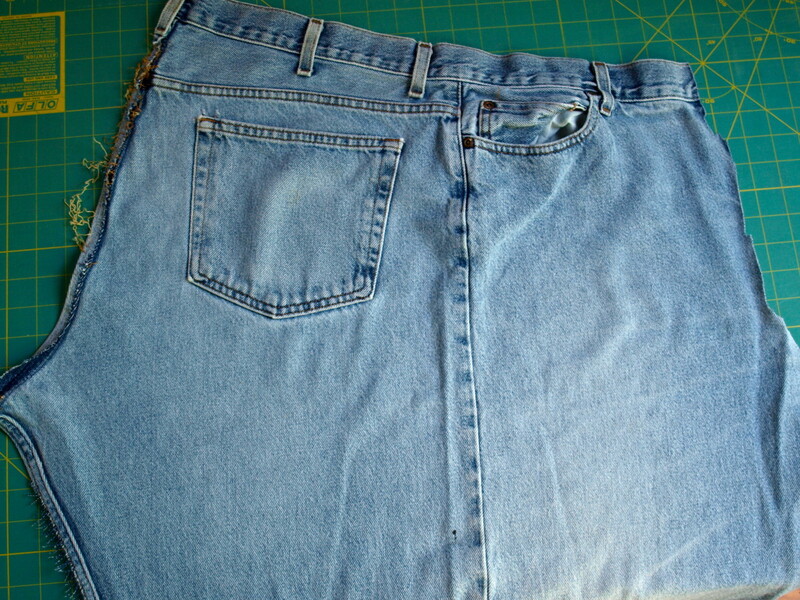 Using a seam ripper and scissors, disassemble the blue jeans. The best way to do this is to split the jeans in half. Take apart the inseam first. 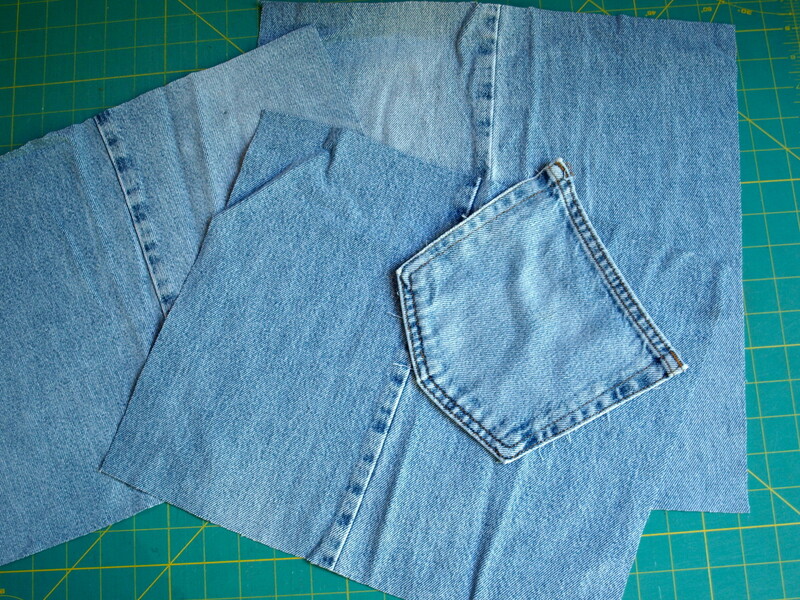 Then cut the center of the jeans, from the crotch to the waist, along the zipper line in the front and the center seam in the back. Press open the two halves. One piece 14 1/2" by 14 1/2". The pillow form is 14 inches and the 1/2 inch is for the seam allowance. 2 pieces 14 1/2" by 11". Note that the pieces are almost the same size as the pillow form. You don't want to have a cover that is too large or it will be baggy. Lay your ruler on the fabric and determine where you want to cut. I use the leg seam as a guideline and center it so the seam shows on the pillow cover. Using a rotary cutter, carefully cut out the pieces. 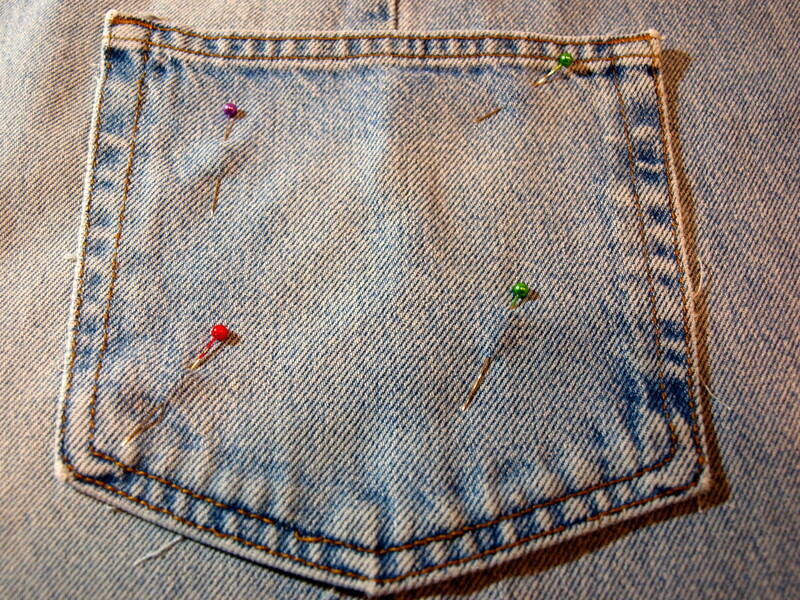 To get a pocket, use a seam ripper to remove one from the jeans. Set aside until ready to use. When deciding on a pillow size, remember the size of the blue jeans you have. Smaller jeans and a larger pillow form may mean that you will have to piece together smaller pieces of the denim to make one large piece. To prepare the back of the pillow cover, you will need the 2 pieces of fabric that were cut 14 1/2" by 11". Take one of the pieces and fold over one of the long 14 1/2" sides. Fold it over approximately 1/2". 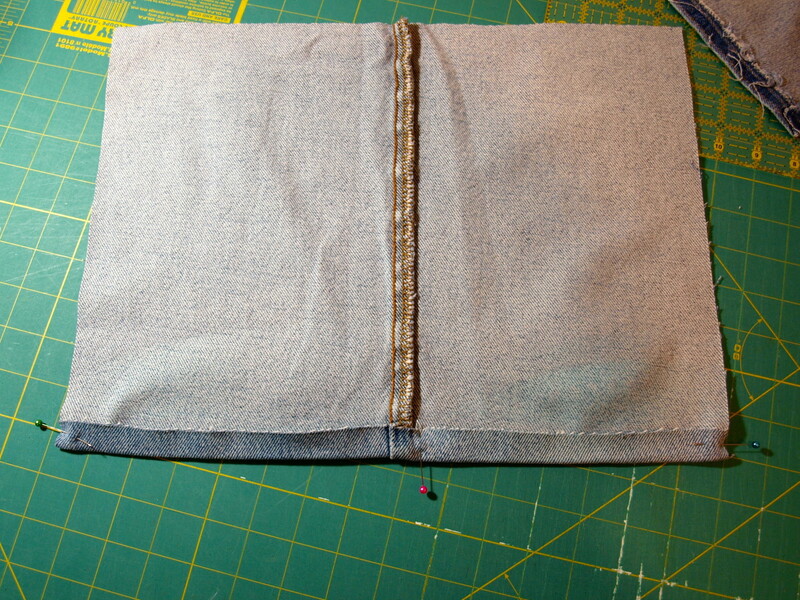 Sew down the folded edge, staying close to the cut edge, not the fold. Remember to backstitch at the beginning and the end. Repeat with the second piece of fabric. 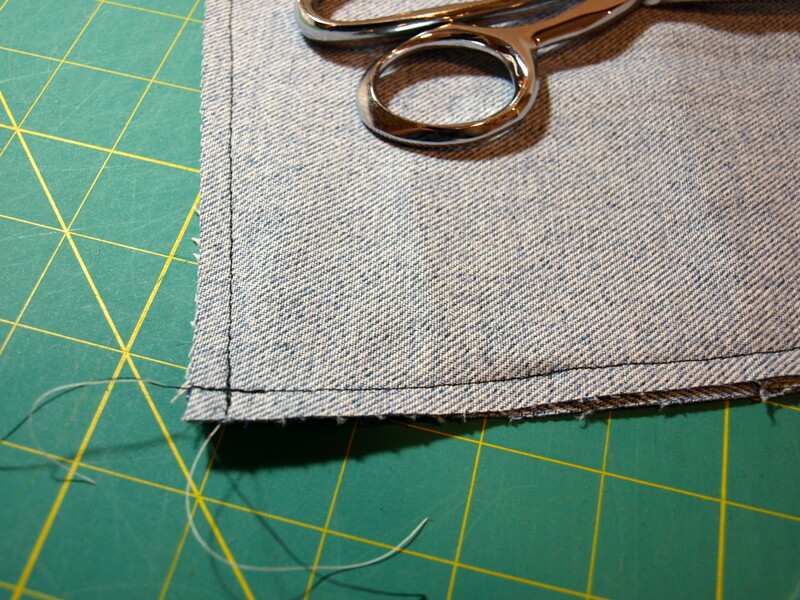 Denim is a thick fabric so when you are using your sewing machine remember to use the correct needle and thread. To get the back of the pillow with the envelope opening, you'll need to do some pinning. Take the two smaller pieces of fabric that have the one finished edge. Lay one of the pieces, right side facing up on a cutting board. The sewn side should be farthest from you, with the long (14 1/2") unfinished side closest to you. Lay the other piece, right side facing up, on top of the first piece. The finished edge of this piece should be closest to you. Adjust the 2 pieces so that the square they form measures 14 1/2" by 14 1/2", the same size as the front piece. Pin the pieces together on the right and left sides, where they overlap, ensuring that they will not slip when sewn. 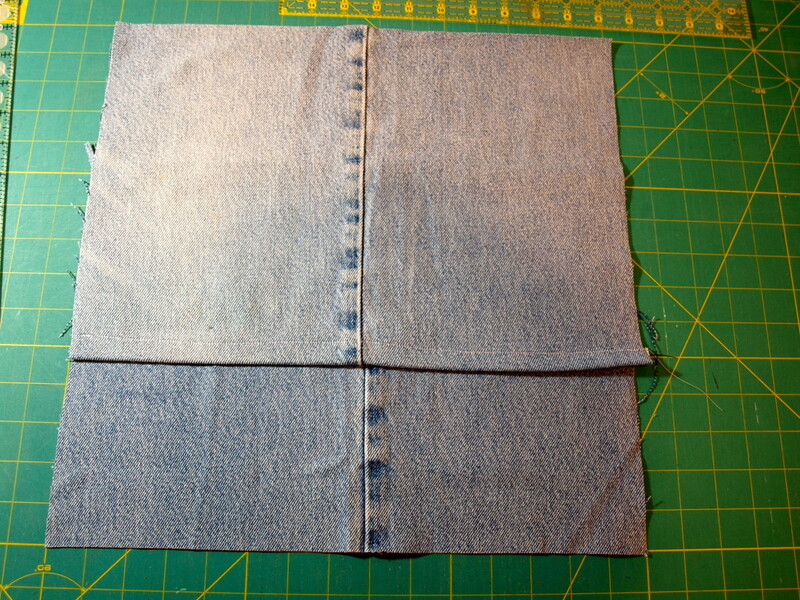 Pin the pocket on the right side of the piece of fabric that you previously cut 14 1/2" by 14 1/2". Place it wherever you like it best. Sew around the outer edges of the pocket, backstitching at the beginning and end. Remember, if you want a working pocket, don't sew across the top. After you put the pocket on you can also add other embellishments to the front of the pillow. A special patch or some pretty ribbon make a nice addition. Matching up all four sides, pin the front piece of fabric, that has the pocket on it, to the pieces that make up the back. The fabrics should be right sides facing each other. Pin around all four sides. 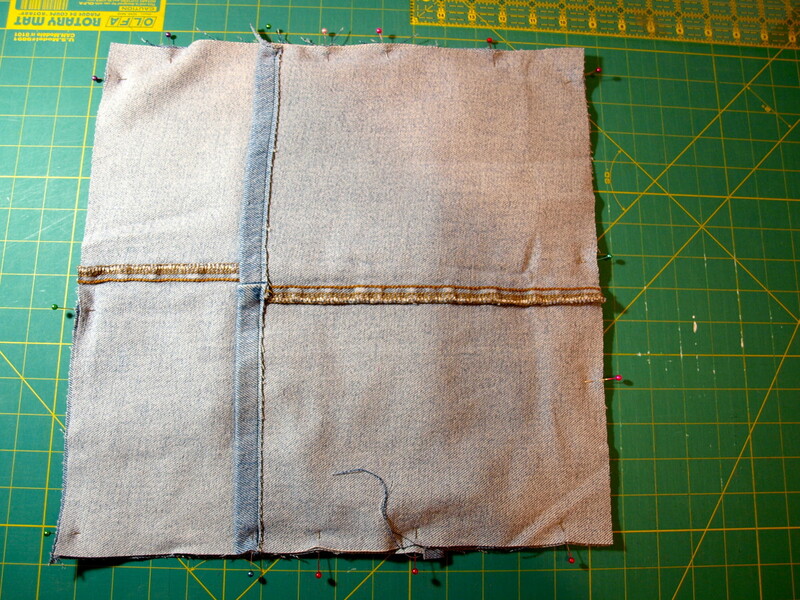 Sew down each of the four sides of the cover, backstitching at the beginning and the end of each side. Make sure to get all the layers of fabric. You may think you need to leave an opening to turn the cover inside out, but remember that there is an opening on the back side for this. Snip each corner on the diagonal. Flip inside out and, using a pointed tool, push the corners out so they are sharp. Don't use a tool that is too sharp and don't push too hard or you could puncture the fabric. I use a blunt pencil or a letter opener, but there are sewing tools you can purchase. Fit the pillow form in the cover and you are finished. Denim was originally worn by Italian sailors from Genoa in the 1500s and was known as the "bleu de Genes". Nimes, France tried to replicate the fabric, but failed. Their product was called "de Nimes". Hence the english words Blue Jeans and Denim. In the late 1800's, during the gold rush, Levi Strauss brought denim to the United States. The pants quickly became popular because of their durability. The rest is history, as they say. Today, blue jeans are worn throughout the world. I love this throw pillow cover and so does everyone else who sees it. My daughter's friends have already put in a couple of requests for a few. 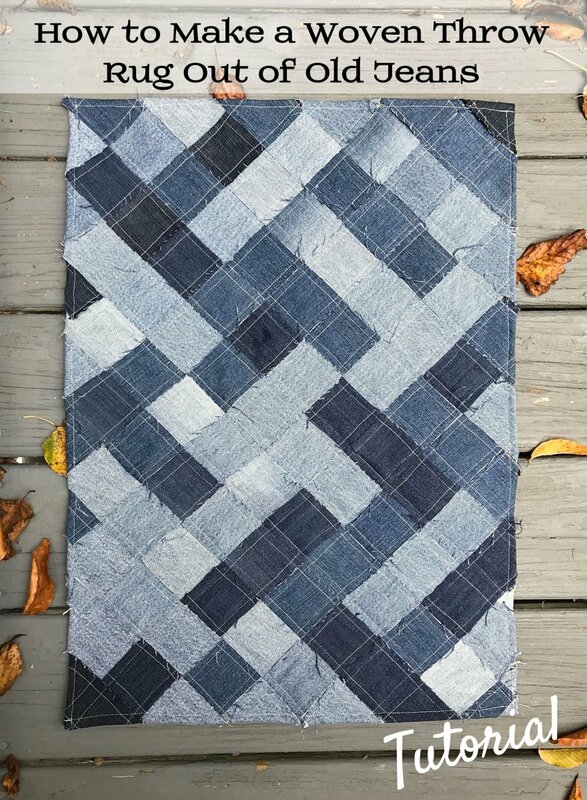 One thing that is so great about it is that, even though I made this one out of recycled blue jeans, it can easily be made out of another fabric. 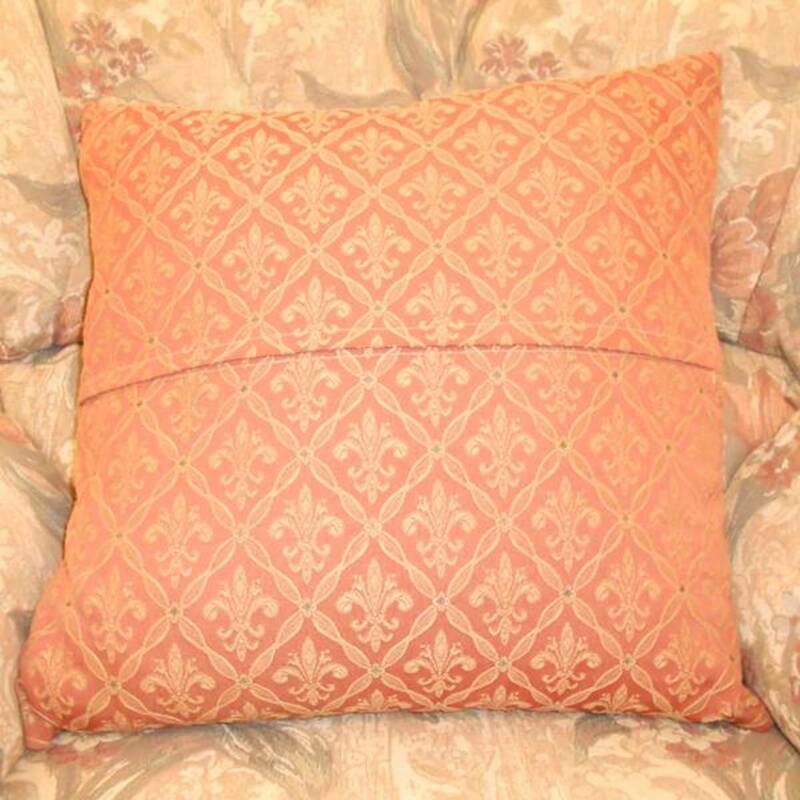 The pattern is also easily adjusted to fit any size pillow form you may have on hand. An old pair of brightly colored jeans or a torn pair of khakis would look really cute. A pretty gingham blouse that no longer fits would also be nice. 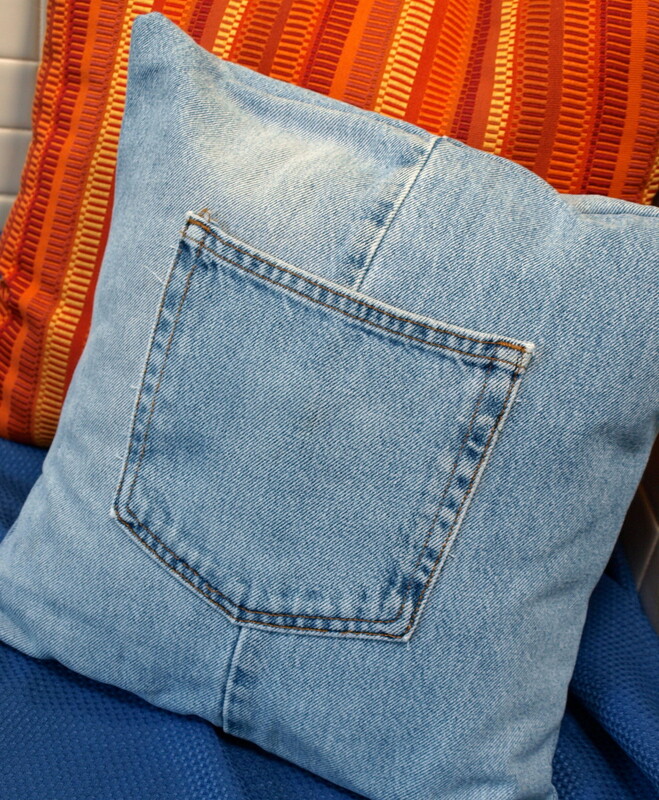 The next time you have a pair of old jeans that are headed for the trash bin, make this pillow cover instead. You'll love it! Is there a video? I don't know if I am doing this right. This project turned out great. We wear special fire retardant clothes at work and for someone’s retirement I used your pattern and turned his old pants into a pillow. I’ll also grab a shirt of his and make a matching shirt pillow. Hi sparleyfinger - Thanks so much for checking out this project. My daughter still loves hers. You are right, it can definitely be customized. Happy New Year! Thanks so much HealthyLivin7500! Glad you liked it. I've got a pair of jeans right now that is begging to be made into another pillow. Omg that is an awesome idea. Thanks for sharing!!! I appreciate it cygnetbrown. I love doing thing with old jeans. I'm working on another project now. I just need to get my camera out and keep taking pics. Glad you enjoyed the hub and thanks for commenting. What a cool pillow! There are so many things that can make using old jeans. I love it! Thanks ComfortB! I'm glad you be making a pillow. They are fun in any room of the house. I appreciate you stopping by and your support. I have a few jeans pants that my son outgrew. I was going to cut them into shorts. Now I know what to do with those. Nice tutorials. Voted up and useful. Glad you stopped by to check out my hub Think Creatively! Your nieces will love this pillow and it is incredibly inexpensive to make, which is a nice bonus. My daughter's friends love it. Thanks for the kind comments. I love the pocket on the pillow idea! That's just so cute and useful. I think I'll make a few of these for my nieces' beds and put a cute little stuffed animal in the pocket! Thanks so much Suzanne. I like making things out of old jeans. Now that it is cold here, I need to get started on some more projects. Thanks for reading and commenting. Very clear tutorial and I love the step by step photos! 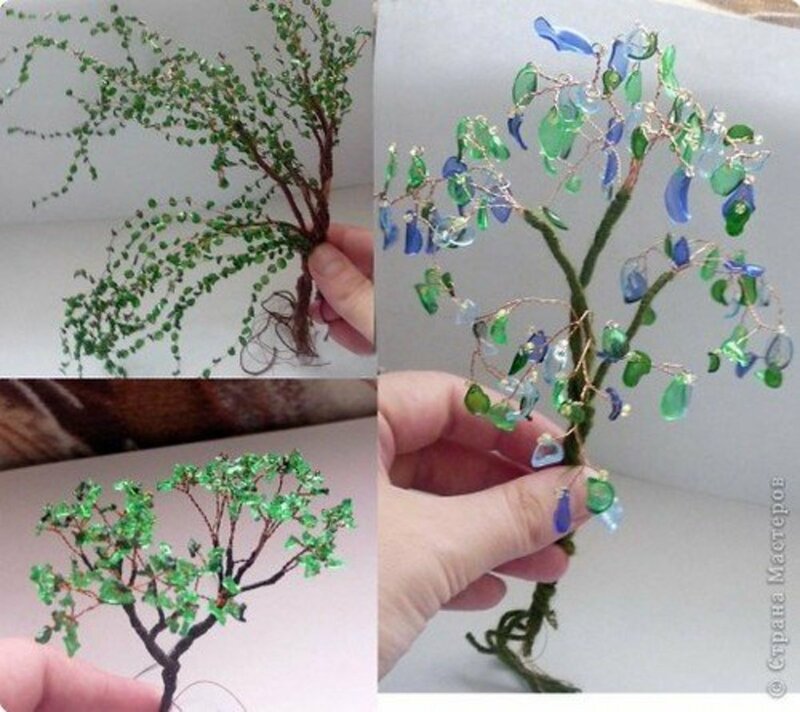 I have seen these done before as well as handbags made out of jeans for markets etc. I used to make rag rugs out of my old denim jeans. A great read! Glad you enjoyed the hub moonlake. Jeans are fun to work with, and I like that fact that I'm saving a little something from the landfill. Thanks for reading, pinning and commenting. I love this idea. I have made pillows from just about everything including jeans, sweaters and shirts. Pinned and voted up. Thanks Deborah! I was just laying my head on one of these pillow. I appreciate the support. What a great idea, and so cute, too. I'm pinning this! I love those denim bags and cut off shorts except I always end up fraying them too much and then they are unusable. Thanks for reading and commenting. Have a great day! My jeans usually become cut off shorts. I've made a denim purse out of the material, never a pillow. Great idea!! Thanks Your Cousins - I like the idea of making it for your husband. It's a great gift for a man and a little different too. I appreciate the comments. The jeans throw pillow is a great throwback accessory. I need to make one for my husband and put it on his favorite chair. Since he can never find his keys -- he could just put them in the pocket! I'm glad you enjoyed the hub thelyricwriter. I definitely could see this being sold at craft fairs and making them will make room in the closet for other things. Thanks for the kind comments. I appreciate the support Michelle. It is a fun accent pillow for any room. Thanks for reading. GTF, what a great idea! We always pass our jeans down to anyone that needs it at the time. Now that we're old :) we always keep them piled in the closet. Just the idea is very creative, even something you could possibly market locally. Big thumbs up, voted up, useful, awesome, and interesting. A quaint way to know your old jeans, Glim! Thanks for sharing! Thanks ElleBee - I love these pillow and get great comments when I have people over. I hope you give the project a try with your jeans. Thanks so much for reading and commenting. I have some jeans laying around to be made into projects. Never even thought of pillows! Hi Crystal - I like those purses too. I'm all for recycling things like this. Thanks so much for reading and sharing. Thanks so much Heather! I often find candy wrappers in mine (I think my daughter stashes them there). Glad you liked the project. I appreciate the support. Very cool. I've seen purses made from old jeans too. Sharing this one. Thanks ktrapp! I would need 3 pockets for our remotes too. Sorry it took so long to respond. Been away for a few days. I appreciate the comments. 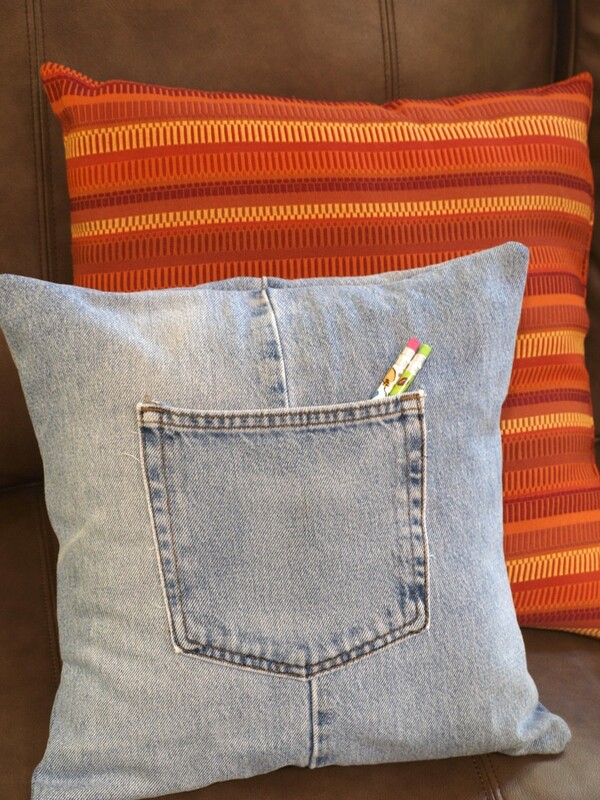 What a great idea for old jeans, not to mention a great place to stash the tv remote. I would need three pocket pillows for that, though. Thanks so much StoneCircle. I hope you love it as much as we love ours. Great idea for the remote! Thanks for the support! Well now I will have a new sewing project! Maybe this will solve the lost remote problem my house seems to be having! I appreciate the support suzzycue - I love denim throws, especially in the winter. They are nice and heavy and warm. Thanks for reading and commenting. This is a great pillow and it would match the throw I made out of jeans for my lazy-boy. You know I love to decorate from found objects and I love your pillow. I am pinning this and sharing. Thanks so much for all of the support Rajan - Glad you enjoyed this hub. It would be beautiful in some of the lovely fabrics I have seen from India. Thank you Thelma. I appreciate your nice comments and hope you get a chance to try it. I've had to make a couple more as my mother took a couple home. The pillow sure looks cool, Glimmer. Thanks for sharing. Voted up, useful and beautiful. Pinned and shared on FB. Tweeted. This is a great idea. I still have a lot of worn out jeans. Your step by step instructions are easy to follow. Thanks for sharing. Voted this up and pinned to my DIY board. Thanks so much marion langley! So glad you enjoyed it and hope you give a try some time. Hi ESPeck - A kindred spirit who makes things out of old clothes rather than tosses them. Glad to see that and glad you are going to give this a try. Thanks for reading and commenting. Vibesites - I think a lot of people love the pocket the best. I hope you give a try when you get a chance. It really is a fun and useful project. Thanks for visiting and commenting. This is fantastic! Most of hubby's old jeans are already made into other things by now, but the next time we need to get him new ones, I'll have to try this out. This is really neat, Glimmer! I have a number of unused jeans and I don't know what to do with them. The pillowcase you made is cute and it has a pocket! Hehehehe. Will try to do that myself (and thanks also for introducing the quilter's ruler). Up and useful. Thanks Carl8033. I really appreciate it. I'm glad people are enjoying my project! The do wear well avainnovice, unless of course, rowdy college students keep spilling stuff all over them. Then maybe not as long. :-) Thanks for stopping by and reading. Thanks so much pstraubie. Sometimes it hard to get the right description on instructions so I appreciate your comments. Hope you get a chance to do this sometime. Have a great day! That's a very creative way of recycling jeans I would say. Very clever in deed. Great hub. This is a great idea, and I'll be that they wear well, too. Much appreciated Nancy. My husband always teases me that I like to write too many directions down, but for things like this it is helpful. I appreciate your kind comments. Have a great day! Hi zanaworld - There are lots of things you can make with all of your jeans. Bags are cute too. Try a different thing with each pair of jeans and you'll end up with a whole house of fun items. Thanks for reading! That's so nice of your to say younghopes. It really is a fun project that I hope lots of people will try. I appreciate it Ceres Schwarz! I think the pocket is what really makes it special and fun. I think everyone loves denim things. Thanks for the kind comments. Thanks so much oliversmum. It was a fun project to create which makes it so much easier. Glad you enjoyed the hub! Thank you for writing such an interesting hub. I really liked the way you explain how to do this sewing project in a way that is easy to understand and follow. Voted up! Teaches - I think you should buy lots of cheap jeans and make lots of them. Just kidding. Teens love them, but my mom just stopped by for a quick visit and said she wanted one too. They are fun and funky for all ages. Thanks for commenting! Thanks so much Dolores. I'm glad you enjoyed the hub. It would make a cute bag and it probably would not be too hard with a few modifications to the pattern. Hi alexmk. It would be a good place for the tv remote. I never thought about that. As far as sewing machines are concerned, it all depends on what you want to do. There are so many out there, it's probably best to go to the store and try out ones with various features. Good luck and thanks very much for reading and commenting. Thanks so much Jackie! - I think that's a great idea! I have more in my basement so I need to get sewing and stop writing. Have a great week. Wow. I have lot of jeans requiring recycle. There are jeans which are unused. I have been thinking turning those jeans into bags. Now this one looks wonderful. A pillow cover! The pocket use is done intelligently. Thanks so much Kathryn - This is definitely something that could be done with all kinds of clothing. Would even be pretty mixing things, like jeans and a floral blouse. I'm so glad you enjoyed the hub. Look forward to hearing about your pillow. Creative and interesting hub. This is one great way to recycle old jeans. The throw pillow cover made with recycled jeans looks fantastic and it's great how you can even use the pocket of the jeans to put things in as seen in one of the images. What a brilliant idea. Thanks for sharing with us. This is a great gift idea for teens. 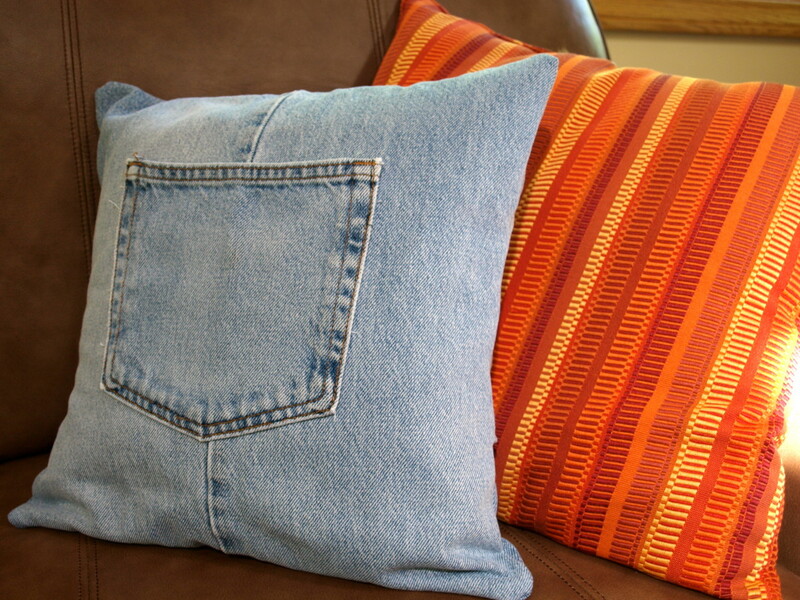 I can see how the jeans would add to a casual décor, but the pocket is really fun. I may have to stop by the consignment shop to pick up a pair to make a Christmas gift. Thanks for sharing. Hi Bill - I hope Bev gives it a try! It's lots of fun and easy. Looks great too (in my humble opinion). Thanks so much for stopping by and reading. Many thanks Suzie! I think anyone would like this pillow. Not too frilly and a nice reuse of items. Glad you liked it and hope you bring out the sewing machine and make a few! Have a great week. 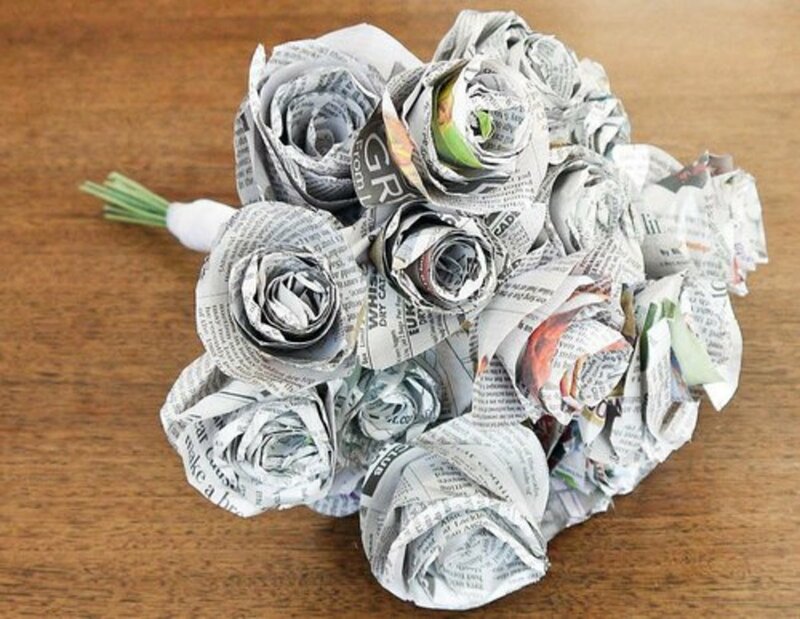 This was really cute, a great way to reuse. The way the pillow looks, the design would make a neat bag too. Interesting, perhaps the pocket is a good place to store the tv remote. What would be a decent sewing machine to get? That is sooo cute! I will have to try it and I just made a stack of jeans to get rid of, so I see at least two in my future. Thank you! I appreciate it europewalker. I love saving clothes to do things like this. Some have such sentimental value. Glad you liked the hub. Thanks so much Bill D. I have a nephew going off to college in the fall and I thought he would get one with some money in the pocket. That is something I forgot to mention, but should probably add, guys like this pillow too. It's not frilly unless you want it to be. I appreciate all of your support. This is a great idea! I save older clothes, and always mean to go through them and make something crafty out of them. 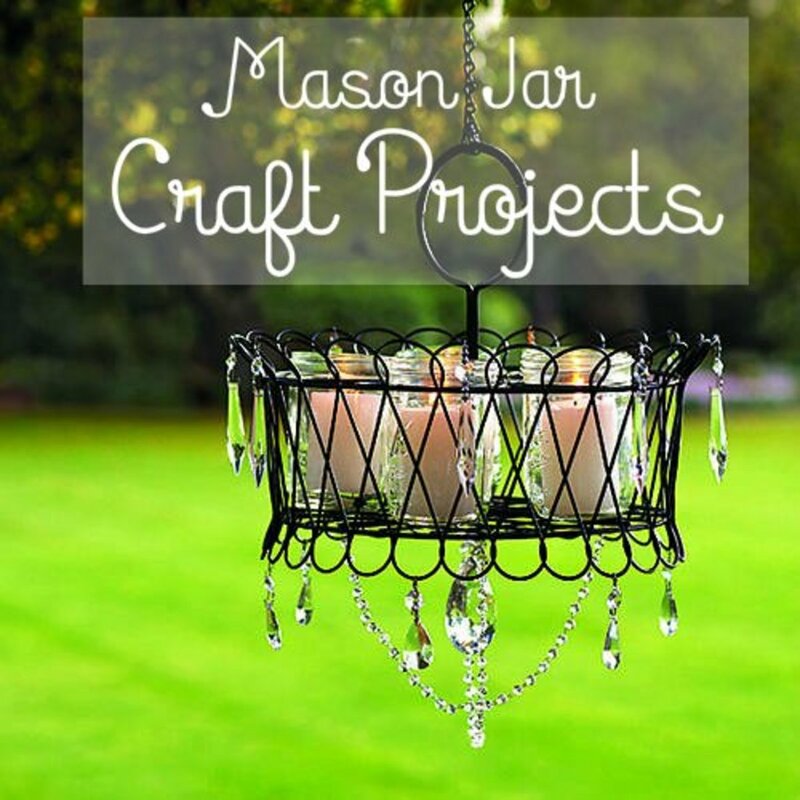 I am going to bookmark this article, and sometime I will go ahead and make one of these! I work at a craft store, and it would be pretty easy to stock up on a few supplies, so I could make items such as these when I have the time. I also like the little background story on jeans and denim. Thank you for sharing this with us, and have a wonderful weekend! I hope you are having a great weekend my friend. Well done! Wow, how funky! A great idea, how creative of you! My other half who hates cushions ( I LOVE them) may be persuaded with this! Love the clear photos and instructions. 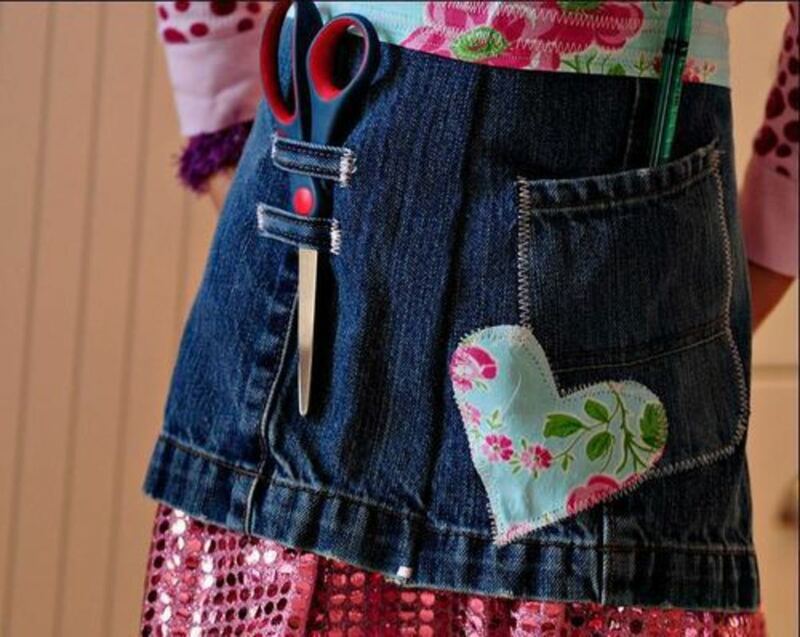 I have not sewn for ages but love to try this and see my nieces and nephew going mad for them so great idea for gifts! Thanks so much, votes, shared and pinned to crafts! Love the pillow cover, what a great way to recycle old jeans. Great hub with useful instructions, voted up.